With three out of eight Congress legislators boycotting the high level crucial meeting in Delhi, party leader Rahul Gandhi has told Goa leaders to work aggressively without closing doors for alliance. Besides rebel Congress legislator Mauvin Godinho, those who did not attend the meeting included Vishwajeet Rane, Pandurang Madkaikar and Jennifer Monseratte. While Alex Reginald Lourenco reached late and then met Rahul personally, only three MLAs attended the joint meeting – opposition leader Pratapsing Rane, former chief minister Digambar Kamat and Babu Kavalekar. Also present were Goa Congress chief Luizinho Faleiro, former CM Ravi Naik and AICC secretary Girish Chodankar. The crucial session of personal and collective meetings convened by Rahul went on for three and a half hours, with Gandhi meeting each one personally and then collectively. 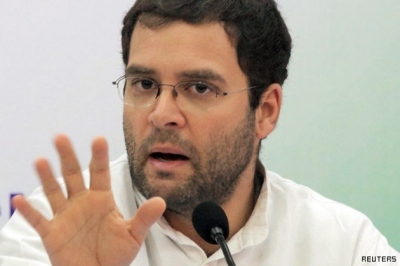 Sources disclosed to goanews.com that Rahul advised the state leaders to go aggressive against the BJP-led government while expressing dismay over the present mild approach of the party. Rahul has also advised the party leaders not to bother about the revenge politics the BJP has adopted but to face it boldly and go for election with full aggression. Though the meeting was told to be fruitful, it needs to be seen how the national leadership tackles the rebellion within the legislature party, especially by leading MLAs. Though Madkaikar was the second MLA after Mauvin to take open antagonistic stand against the party, at least two more MLAs have also displayed their anguish by defying the Gandhi family. In spite of expelling her husband Babush Monseratte from the party, Jennifer was quiet all this time. Vishwajeet has also taken a defiant stand though his father Pratapsing Rane attended the meeting as a loyal soldier of the party. It needs to be seen how the national leadership tackles the rebellion when national surveys are indicating that Congress can enter the double digit in the next election. How even Congress can think to Contest Election? Congress stomach is still not full by eating 35 Thousand Corers of Goans? Congress is dreaming to build Mopa Airport and get share in it. Congress is thinking that Goans are fool that they will vote Congress to start Corruptions again.